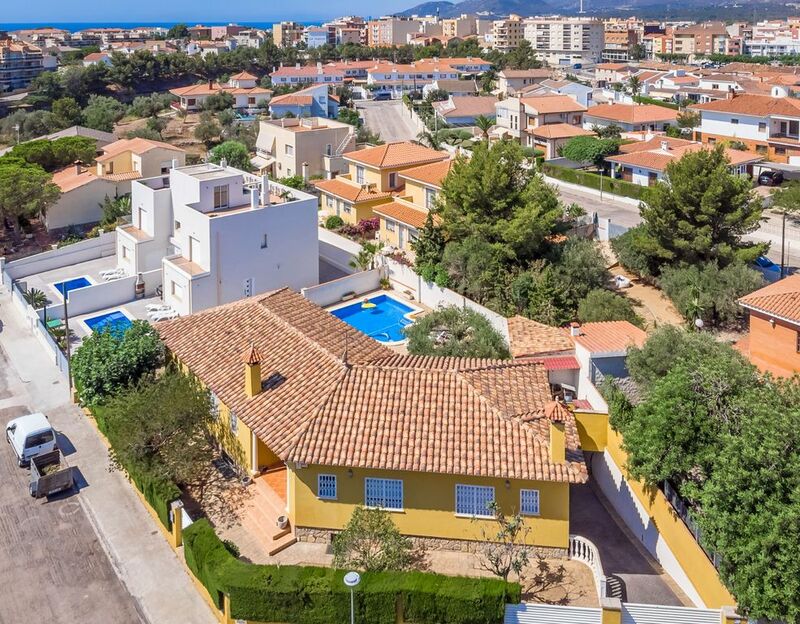 Villa Yelmo is a new and comfortable villa that has 2 doble bedrooms and 3 twin bedrooms, 2 bahrooms, 1 toilet in the pool área. Тhe kitchen is fully equipped with oven, fridge, washing machine and dishwasher. Large garden with barbecue and with swimming pool is private and fully fenced allowing for total privacy. In this villa can sleep comfortable 10 people. It has air conditioning, wi-fi and satellite channel. Several fruit trees surround the villa and garden, has an excellent location in a quiet and safe environment, surrounded by pine trees near Playa Cristal in Pino Alto, a clean, spacious beach with a lot of activities. Hospitalet del Infant, which is next door, is a great town to go for a walk and enjoy the beach and fine dining. The local amenities are excellent and everything is very close. Plenty of bars and resturants, supermarkets, gift shops and a medical centre just in a few minuts walking distance.